So this week since the last post I have been concentrating on research rather than writing. I decided that I need to commit to getting the sequel to By the Sword’s Edge out at some point soon – and the only way to do that is to firm up some research on the Pontvallain campaign of 1370, which is the stories setting. As such I have now completed a chronology outline for the campaign, which is linked to the By the Sword’s Edge page on this site. And the other major part of the research programme has been to look up some of the primary sources for the campaign so I can get to grips with some more of the detail. I have used Jonathan Sumption’s Divided Houses as a starting point to get primary source references. Again I’ll probably post a list of these and their availability at some point as well. That’ it. Will probably post more infrequent – perhaps a couple of times a week. So this last week was a big wash out for me – big time. Absolutely no new words at all. Away for business and then caught a bad cold, lots of travelling and although I know I should be, I just didn’t do any writing. That’s it – not much else to report! too many characters and too tricky and disorientating to keep switching. Tricky though if you don’t read the next book straightaway – so I suppose I’ll need to get on with A Dance with Dragons! While I was away I picked up a mass-market edition of Umberto Eco‘s The Prague Cemetery. I’m half was through so far and enjoying it immensely. Much better than the last Eco I read, Baudalino, which was a huge disappointment. The Prague Cemetery covers some of the same ground, but from a 19th century setting, of Foucault’s Pendulum, which was ace! Naked Writer #12: Getting a Training Plan? Not a great deal to report unfortunately for the last few days. I did a couple of hundred words on the 11th and another couple of hundred on Friday, 13th – getting into a new character in Chapter 2 of Dragons Above. I’m enjoying writing the new character – an ageing Field Marshall – but simply had a lot on my plate with work at the moment – not necessarily time-sucking, but more mental energy sucking, I think! I’m hoping to get into a better routine with writing next week – I think I just need to commit a certain amount of time from my day to make it habit forming. The problem with grabbing a few words here and there – which I have been doing recently – is that sometimes those short moments of time dry up, or if work is intense the last thing I can think of is writing. So I think that’s where having a firm time and schedule can help get things done. I’m also getting back into running at the moment, and I’m following a training plan to build up my stamina – and because I have a firm schedule I tend to commit to doing the runs that I might otherwise decide I can’t be bothered with. Perhaps I need a writing training plan to keep me on track? Came across this story on the net this morning. Medieval Superheroes – all your favourites, like Superman, Batman, Wonder Woman and Lex Luthor reimagined in Medieval Garb. 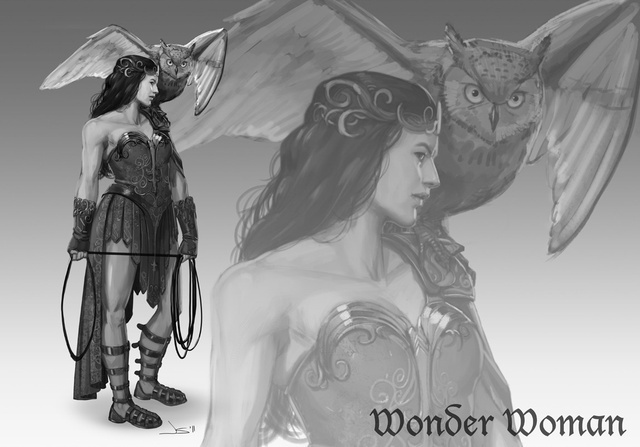 I think Wonder Woman’s my favourite – not paticularly Medieval – she looks like she’d be at home in a Conan film – but good nevertheless! Monday was a fairly slow start to the week yesterday – quite a bit to do at work and when I did take a break I didn’t feel that inclined to do any writing. My main session was 353 words on Chapter 1 of Dragon’s Above at lunchtime. The words flowed pretty well and I enjoyed what I was writing. I often feel more at ease writing the start of the novel as I don’t feel the same pressure to move the story along fast – instead I can show a scene at greater leisure. Also I submitted one of my short stories, Bring on the Night, a medieval horror/fantasy to a new market. It’s been to four so far, so I keep bashing away with it and the other ones that are doing the rounds. Back to Feast of Crows now that I’ve got through most of the backlog of Alt Hist submissions.